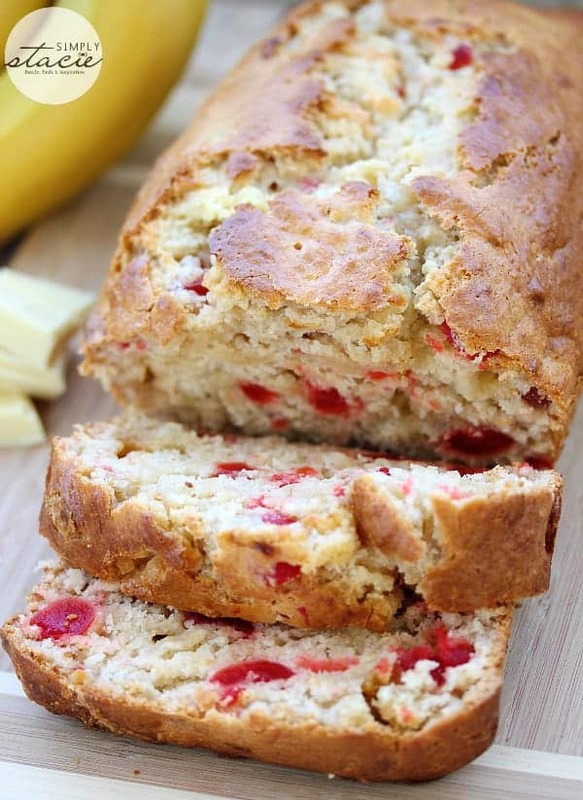 I’m not crazy about bananas, but I do love a good loaf of banana bread! Growing up, my mom would often bake banana bread. I love eating mine warm with some butter on top. This week, the Friday Recipe Club theme is bananas! It’s National Banana Bread day on February 23rd so I decided to do my own version of banana bread with a little twist. I made mine with white chocolate (my fave!) and cherries. If you prefer regular milk chocolate, feel free to replace the white chocolate with some milk or dark chocolate instead. 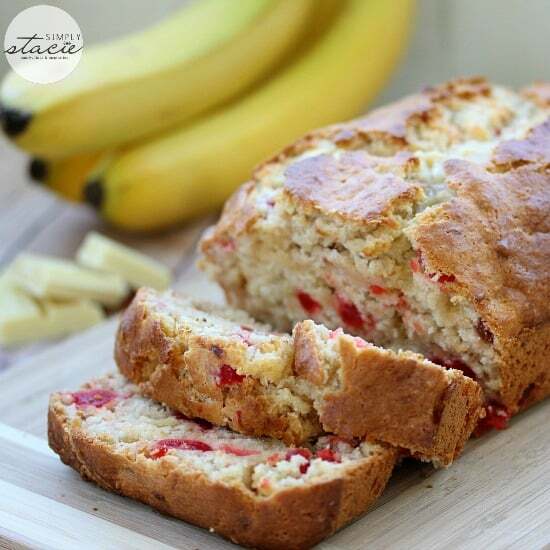 For more banana recipes, check out this Banana Bread Sheet Cake, Easy Chocolate Chip Banana Bread, Sprouted Grain Blueberry Banana Bread, Best Ever Banana Chocolate Chip Muffins, Banana Zucchini Bread and Easy Chocolate Chip Banana Bread. My version of banana bread with a sweet twist! In a bowl, mix together eggs, bananas, oil and milk. Add in flour, sugar, baking power and salt and stir until moistened. Add in white chocolate and cherries and mix to combine. Pour mixture into prepared loaf pan. Bake for 1 hour or until a toothpick comes out clean from the centre of the loaf. Cool in pan for 10 minutes then remove and cool completely on a wire rack. Have to try this! Looks great! Think I might make this the next time an occasion comes up, love banana bread and this is a nice twist, thanks!! Cant wait to try this it looks yummy…. Can’t wait for you to make these also sis! Oh my goodness…this sounds so yummy! Due to low potassium issues, I have to eat bananas and hate it! So I try to find banana recipes to help me tolerate bananas. Will have to try this out. Thanks! Looks delicious and simple… Will also add this to my brunch today. Thanks! This sounds good and easy enough for me to make. 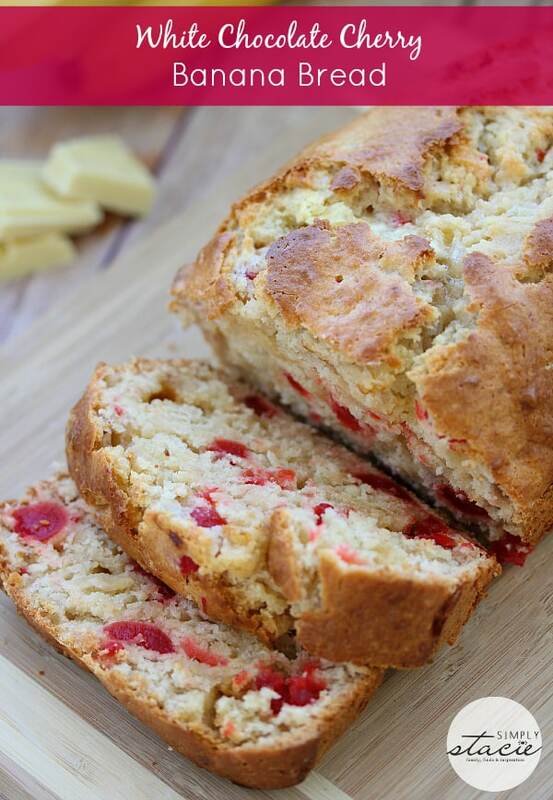 I am so going to make this banana cherry bread~love bananas and Love cherries. Looks like a great recipe to try. I saw somewhere that you could freeze bananas so this would be a great recipe to have on hand. This sounds yummy! I love maraschino cherries so it’s fab to come across recipes that include them, can’t wait to try this! white chocolate in bread? I’m gamed! Just made this cake tonight! Found your recipe on food gawker. AMAZING, MOIST, YUMMY COMBO! Thanks for posting! I think I need to make this right now. I make banana bread regularly as I love a slice with coffee for breakfast. I’ve never seen this combination before thought. 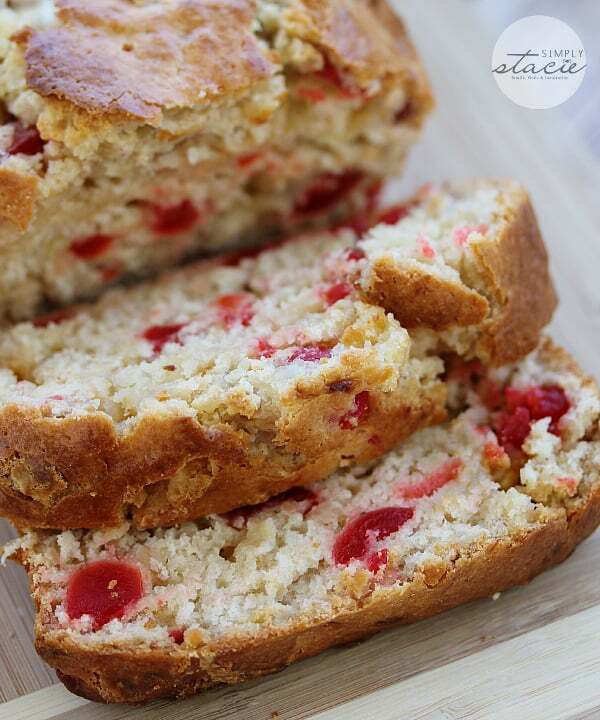 I love cherries so I definitely want to give this recipe a try. Do you think this would taste good with regular tart cherries?? I think that would work too. Flour – self rising or all purpose? this looks so great! pinned! This looks so good. What a unique recipe. I’m going to have to try this one. 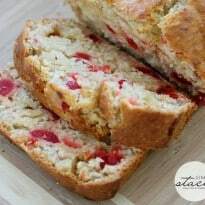 The bread looks so moist and the maraschino cherries are such a nice touch. Oh, what a beautiful bread! My name is Katie and I host Fall Into the Holidays, now open. All entries get pinned. I would love to have you link up! My oh My doesn’t that look good!! Wow…this bread looks amazing! I can’t wait to try this deliciousness for my family! Thanks for sharing! PINNED! This looks delicious! Definitely pinning and trying sometime. I found you on Say G’Day. Thanks for sharing! Flour, is that all purpose or self rising? Hi, I’m trying to use less sugar. Could I take out half a cup and replace it with some flour for volume, and if so .. how much? Try taking out half a cup of sugar and replacing it with an extra banana.